Consumer packaged goods companies are driving foot traffic to convenience stores and combating the downturn in the grocery industry with custom mobile offers. The average consumer only visits a c-store out of immediate necessity. Traditionally, a consumer arrives to fill up their vehicle or quickly pick up an everyday item. It’s rare that a consumer would venture outside of their normal buying habits when visiting a c-store. With mobile offers, consumers are incentivized to enter a convenience store and try new products. This helps to increase sales volume for both merchants and CPG brands, and to convert one-time shoppers into loyal customers. Check out the top four reasons consumer packaged goods companies should take advantage of the c-store opportunity. Consumers are creatures of habit. Determining consumer purchase preferences helps CPG brands create offers that encourage product trial. According to Management Science Associates, 54percent of transactions in convenience stores contain only one item. Among the best-selling items in c-stores are beverages, tobacco products, snacks and candy. CPG brands looking to attract new buyers may distribute a mobile offer for an item purchased in conjunction with an item a consumer would typically purchase. With P97’s Ad Network, CPGs can access a consumer’s purchase history and create customized offers to persuade the buyer to try new things. An example of this offer could be, ‘Get $1 off any Hostess product when purchased with a coffee.’ This coupon incentivizes a consumer to purchase an additional item they would have otherwise skipped when buying their morning coffee, increasing their basket size and driving sales. Once a consumer’s purchase preferences are identified, an offer must be powerful enough to change a consumer’s buying behavior. Discounts are a great strategy to grab a consumer’s attention, but the benefit of the discount must offset the initial cost of an item to motivate customer spending. While percentage discounts may be enticing on higher priced items, c-store items generally don’t cost more than a few dollars. That decreases the effect of a 10 percent discount, making the offer easy for consumers to refuse. A set ‘dollar off,’ or ‘buy one get one,’ promotion produces a better economic value, resulting in higher customer redemption and increased sales. Consumers like to feel like they are winning, and providing that experience draws customers in and helps to improve customer retention. The structure of an offer greatly impacts the success of both CPG brands and merchant retailers. Deals can be structured to offer a discount on a single item, or a combination of items purchased at the same time. Before implementing a mobile offer, understand how the discount affects the total cost of the transaction and return on investment for your brand. The previous example, “Get $1 off any Hostess product when purchased with a coffee,” provides great value to the customer but also reduces the effect of the discount on the merchant due the increased basket size. The larger the transaction cost, the smaller the per-item discount. This offer also increases the CPG’s return on investment from the offer campaign. Structuring an offer strategically improves customer redemption rates and increases sales for both the merchants and the retailers. Promotion, distribution, and consumer-friendly redemption techniques are imperative to CPG offer success. Today, millennials are the driving force behind c-store success. According to a 2018 Convenience Store News study, 16 percent of all millennials visit a c-store daily and make up one-third ofall c-store shoppers. CPG brands are adopting mobile offerings to reach this target audience. Alliance Datareports that 84 percent of millennials use their phones in store for shopping assistance. The P97 Ad Network enables CPG brands to build digital offers in the PetroZone portal and promote and distribute them to their target audience within a merchant’s existing app, providing CPGs with the ability to reach customers in store while they’re in the research phase of shopping. 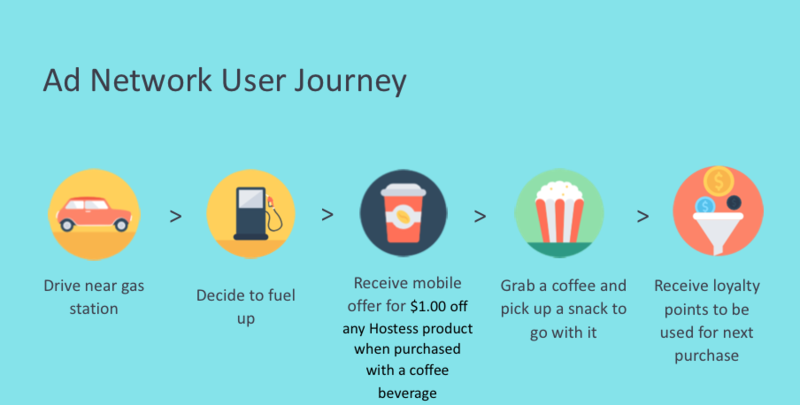 When a consumer arrives at a fueling station to get gas, the CPG company can use the Ad Network to distribute a customized mobile offer incentivizing the consumer to enter the c-store and make purchases. This transaction is depicted in the User Journey above. The immediate response times of these incentives improve customer redemption rates and increase sales for consumer package goods companies and merchants alike. Retail has taken a hit in the past few years, requiring CPGs to research new marketing avenues. Convenience stores have largely avoided the downturn because of their ability to cater to the on-demand generation. CPGs should focus marketing spend in the c-store segment to capitalize on the growth in millennial spending.